MediaTek currently has a differentiated resonance power solution in the market but the manufacturer wants to introduce a new product agnostic charging platform to device owners. 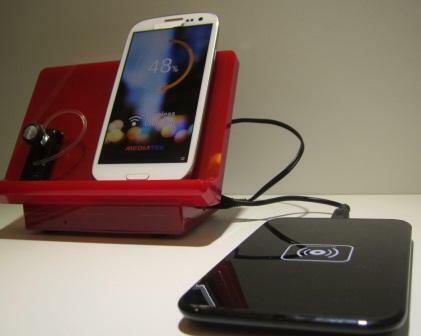 Multimode wireless charging allows users to charge devices anywhere, anytime on a specific pad or surface. An added advantage of MediaTek’s new solution is that it can charge over long distances. However the growing demand for wireless charging is met with the challenge of competing specifications on how to implement the solution. Nokia, Samsung, LG and Verizon support inductive (tightly coupled) wireless power solutions. Another camp consisting Google, AT&T, Protcor and TI support resonance (loosely coupled) wireless power solutions. “From a business viewpoint, MediaTek’s technology helps to ensure that capital investments already made in chargers for the home, office, retail and automotive markets will be protected, while providing the benefits of resonant charging with new resonant chargers. Users benefit from being able to charge on virtually any charger platform regardless of underlying technology employed.” – MediaTek press statement. Retail businesses, such as Starbucks, are providing resonant charging technology as a convenience to customers. With the multimode charger, these businesses are will therefore benefit from increased revenue streams.